Movie trailers are for hyping upcoming flicks. That's their raison d'etre. 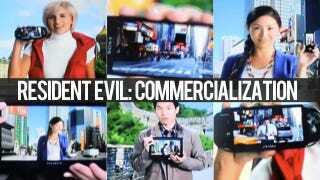 The Resident Evil: Retribution preview did more than that: it's also flogging Sony hardware. The movie stars Milla Jovovich and is based on the horror games from Osaka-based developer Capcom. Sony Pictures is releasing Resident Evil: Retribution, the latest entry in the successful RE film series. And it shows. The first 24 seconds of the minute plus trailer look like a Sony ad. When I initially saw the trailer, I thought I was watching a Sony ad. The trailer opens with happy, smiling people hold Sony hardware, like the Xperia, the PS Vita, and that Sony tablet thing, saying, "This is my world." Then it cuts to Alice, the character Milla Jovovich plays, standing on The White House in some post-apocalyptic hell, saying, "My name is Alice, and this is my world." It's overblown and melodramatic. Then again, so are these movies. Though, more importantly, the way that idealized commercialization is compared with flying monsters is baffling. The whole 24 sec intro feels tacked on, especially because the rest of the trailer features impressive military hardware and futuristic settings. So, the message the trailer conveys isn't that there was all this technology and then it disappeared and everyone went stone age. Rather, the trailer's bizarre message is that there were all these Sony products, and now there are monsters overtaking the world. There has to be more than that, but the trailer didn't explain or hint at whatever that was. Sony's done strange things before via its movie division before, such as when PlayStation Father Ken Kutaragi liked the Spider-Man font so much, he stuck it on Sony's home console. Sony Pictures is its movie company, so the entertainment arm will do as it sees fit for the PlayStation brand—and vice versa. In Japan, commercials are not viewed quite the same as in the West. The easiest way to judge a celebrity's popularity in Japan is count the number of ads he or she appears in. Shillling is not looked down upon. Hollywood, likewise, is not immune to product placement in film. This trailer, however, is different, because outside companies are not paying to have their products in the film. Sony, who is releasing the film, is shoving its products into a trailer—minus any irony whatsoever. I have not seen the final film, obviously, because it will not be out until next fall. Perhaps, the product placement is subtler in the finished motion picture. It better be, because viewers should not have to pay to go see a giant Sony ad. Watch the trailer in the link below. It originally appeared on Attack of the Show, but the trailer does not yet appeared to be up on the program's site.